If you’ve never tried cooking with coffee, or have confined your culinary coffee adventures to sweet coffee recipes, this bacon-glazed coffee recipe will be a real eye-opener. The salty bacon, smoky coffee and sweet richness of maple syrup combine to create a flavor that’s impossible to describe and even more impossible to forget. If you, like Ted Allen, believe that everything is better with bacon, this coffee recipe is an absolute must-try. If you’re among the unconvinced who believe that bacon goes on BLTs and beside your eggs, this coffee-glazed maple bacon will make a believer out of you. One word of caution, though — the salty-sweet coffee-bacon goodness comes with a hefty price tag in the way of calories. Between the brown sugar, the maple syrup and the bacon, you’ll be loading up, but the flavor is so worth the extra workout to burn it off! incredibly delicious salty-sweet treat that’s hard to beat. Assemble your ingredients. Choose a coffee that has full, rich, smoky flavor, like an Ethiopian Yrgacheffe. Darker roasts also give a smokier flavor to the bacon than light roasts. You can brew the coffee in an auto drip pot, but make it extra strong, or brew it up in a moka pot or as espresso to bring out the subtle nuances of flavors. Pour the hot coffee over the brown sugar in a 1 qt. heavy saucepan and let it soak in. Don’t bother stirring or trying to dissolve the sugar yet. It will look like it can’t possibly be enough coffee for that amount of sugar, but that will change when you start heating the coffee mixture up. Add 2 tbsp of maple syrup to the coffee and brown sugar in the saucepan. You can see how much the sugar has already dissolved into the hot coffee without even stirring or heating. Place the saucepan over a medium flame and heat without stirring until the sugar is completely dissolved and the coffee mixture comes to a full rolling boil. I tried to capture a good picture so that you could see what a full boiling syrup looks like. If you peer through the rising steam, you can see the frothy, light brown bubbles. Allow the coffee syrup to boil for about three minutes, then remove it from the heat and wait until the froth subsides before continuing. While the coffee syrup is cooling slightly, heat your frying pan until a drop of water skitters around the pan. Or, you can do as I did and use an electric frying pan that allows you to set the temperature to 400 F. A hot pan is essential to caramelizing the coffee syrup quickly so that it doesn’t just drip off your bacon when you fry it. Lay out a baking rack over absorbent paper towels or cardboard. You’ll be placing the bacon on the rack to drain. Trust me on this. If you try to drain the bacon on paper towels, the syrup will harden and stick to the paper and you’ll end up picking lint off your coffee glazed bacon strips. It’s not fun, or tasty! Dip each slice of bacon into the coffee syrup and swirl it around with a fork to coat it well. Work carefully! The syrup is still very hot! Carefully lay out the bacon strips in the hot frying pan and let them cook undisturbed for about 4 minutes, or until the coffee syrup caramelizes on the bottom side. Turn them over and continue frying them, turning them as needed until they reach your desired level of crispiness. Remove each strip of bacon when it is crisp and browned. Hold it over the frying pan to allow excess bacon grease to drip off, then lay it out on the baking rack so that the remaining excess grease can drip off onto the toweling underneath. If you look carefully, you’ll see that I originally was laying the bacon to drain directly on paper toweling. Now you know why I added in the instruction to set up your draining rack separately for the coffee-glazed bacon. I know from experience what happens when you drain candy-coated bacon on paper towels. It’s not pretty! Let the bacon cool — if you can wait that long. Coffee-maple glazed bacon is like eating bacon candy out of hand. I meant to save a few pieces to make bacon-topped cupcakes, but when I went back after it a couple of hours later, there was nothing but crumbs left on the rack! It really is that good. 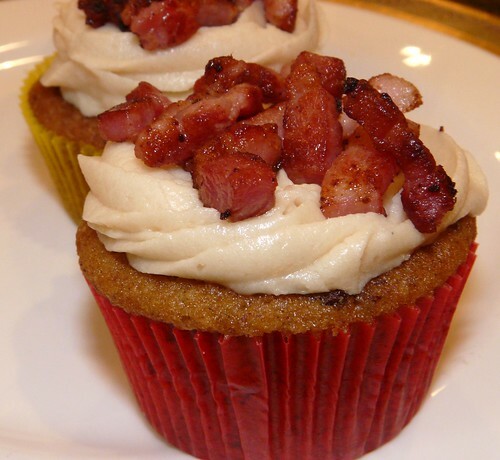 If you can resist the temptation, though, let the coffee-glazed bacon cool completely and crumble to use in bacon-topped cupcakes, like this yummy bacon cupcake recipe from the Little Miss Cupcake Blog.